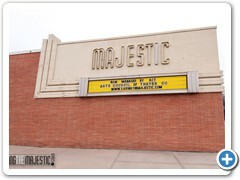 This is a series of images from when we first inherited the theatre in Feb 2013. We have some plans in store and hope to show great progress as the months go by. 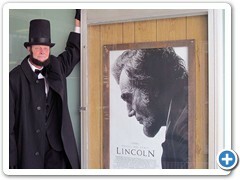 The first movie that we showed was the Oscar winning "Lincoln". We had a great turnout and even Abe himself showed up for the Sunday matinee. Here's a few photos from our first major renovation party. 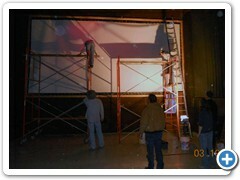 We replaced the screen to get ready for digital projection and removed the seats to prepare for new ones! 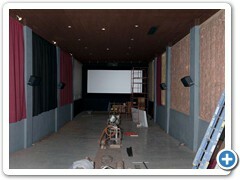 Here are some photos that show the ongoing work by volunteers to update the south cinema to a digital system. New speakers, screen and projector are added as well as paints and wall panels. A great crowd of community volunteers gathered on Feb 2, 2014 to begin the lobby renovations. It all began with the tear down.